If you like to cook and, especially, eat, you know that a dish made with fresh herbs tastes a great deal better than one made with not-so-fresh ingredients. And there is no better way to make sure that you always have the fresh herbs you than to grow them yourself at home. Plus, there are other benefits to growing herbs—you’re don’t just have to grow them because they’re naturally delicious. Growing plants indoors can help purify your air, lower carbon monoxide levels, and remove unpleasant smells. Indoor herb gardens also allow you to be creative and bring fresh beauty into your kitchen. In fact, looking at pictures of beautiful, unique indoor herb gardens is a fun hobby in its own right. Just look at these creative and unique designs here or here! Having some delicious herbs move in with you can be harder than it may seem–we’re talking about living organisms that, if unhappy, will wither. Don’t worry! We’re here to help you add more life to your kitchen with fresh, home-grown herbs. Before you get started planting and growing, you need to make sure that you have an adequate place for your plant friends to grow. You’re looking for a place with plenty of natural light— a windowsill is perfect. Your plants will need around 6 to 8 hours of light per day, so pay attention to how much light is coming in. If you don’t have an area with this optimal amount of sunlight, fret not. There are other ways to make sure that your plants are getting the amount they need. You can use reflector lights with compact fluorescent bulbs to grow healthy herbs. 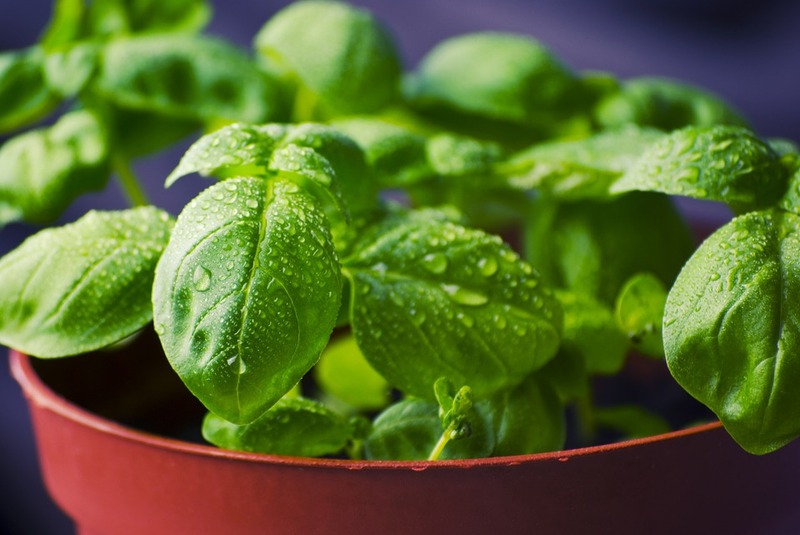 Your indoor herb garden will also need plenty of air flow and proper drainage. Without them, your herbs may contract fungus, and moldy basil doesn’t sound delicious at all. Another important thing to consider while planning your indoor herb garden is which herbs you’re planning to keep. You’ll need to get better acquainted with the herbs in which you’re interested. Some are easier to keep alive than others. Basil, for example, has a wonderful smell and is easy to keep alive. Do your research. Get to know what each herb likes and needs. Also, look for friendly neighbors. Get to know which herbs are friendly neighbors and which are more solitary—mint, for example, should have its own pot. Pay attention to which herbs do best together. Remember, not all herbs get along. Here’s a companion list for some of the most popular herbs. You might want to start slowly. Choose plants that are easy to grow and maintain. Work your way up to the more temperamental herbs. If you need a helpful starter guide for growing your own herb, you’ll find one here. Once you feel ready to grow your herbs, get creative! An indoor herb garden is a great way to create your own unique space. Design something you’re proud of. You can have an indoor terrarium, a hanging garden, and a self-irrigation system. You can even go wild with your own unique labels for your planters. Indoor gardening is a great way to relax, grow your own delicious ingredients, and add freshness to your interior’s design. And if you’re looking for the best possible space for your plants and creativity to grow, move into one of our luxury apartments. Our apartments are spacious and have plenty of natural light. Get in touch with us today!